The media group faced a strong decline of multiple legacy business lines and had a complex group structure, with more than 100 subsidiaries in 30+ countries. Furthermore, the shareholders expected strong revenue growth to adapt to the changes in the advertising market and to be able to sustain the dividend policy. First, the media experts of Arthur D. Little identified and assessed major industry trends, competitive dynamics and the flow of funds throughout the value chain in more than 50 media segments. 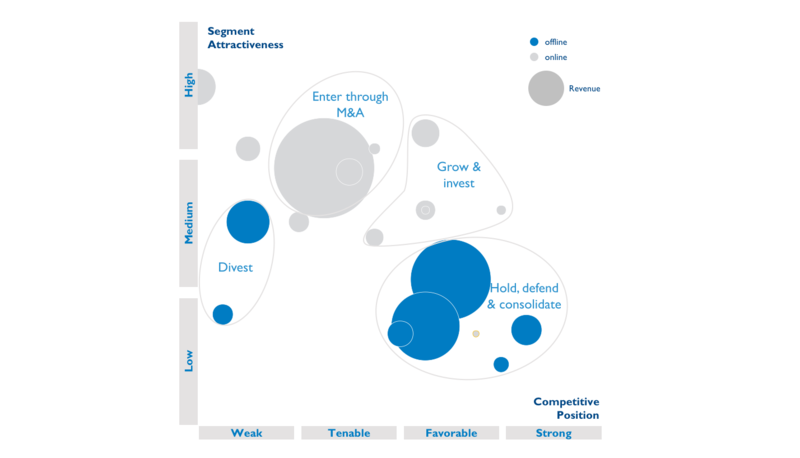 Thereafter, a comprehensive strategic-option space was developed and 20 core and near-core growth areas were assessed for their attractiveness. The most promising growth areas were then detailed in major strategic initiatives and required portfolio changes were recommended. Arthur D. Little identified core and near-core growth opportunities in excess of 600 million euros to deliver a revenue turnaround.